Hedge trimmers are a necessity if you have several hedges or hedges that are particularly large or tall. Hedge trimmers give you that extra reach while precisely trimming your landscaping. There are several types of hedge trimmers on the market: electric, cordless, and gas. Gas-based trimmers offer better long-term performance and power than electric models and battery-powered models, which is why we’ve done the research to find the best trimmers. Weight – More than likely, your hedge-trimming job will take an hour or more to complete, so it’s important to factor in the weight of the trimmer. The lighter the weight the better. Blade size – This is the category in which you will see the most variability. More hedge trimmers range from 13 inches up to 40 inches. Professional hedge trimmers are considered as such at a size of 18 inches or more. Generally, the models on the smaller end are better for smaller hedges, while the professional-grade sizes are more appropriate for medium to large hedges that require a much longer reach. Power – How you use your hedge trimmer will determine how powerful an engine you need. The bigger and longer the job, the more power you need, particularly if you’re looking for a professional-grade model that can handle a long day of work. We’ve reviewed models appropriate for home or professional use, and have found the best ones on the market. Read on to find our favorite brands and models. We considered consumer ratings and reviews. The Poulan Pro PP2822 is one of the best medium-sized hedge trimmers on the market. 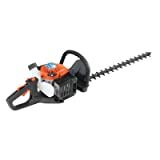 The trimmer has a 28cc engine and a cutting length of 22 inches. You’ll cut with greater ease with serrated, dual sided blades. The hedge trimmer is powerful enough to easily cut through hedge branches with a thickness of ½”, and can cut through larger branches with just a few passes. Almost 16 pounds, the unit does run a little heavy for longer jobs. One of the better features on this hedge trimmer is the swivel handle, which allows you to change your grip for added flexibility and comfort. If you have taller hedges, however, this model may not be the best for you, as the exhaust vent blows directly towards you and the unit lacks an underside support. Remington’s RM2599 is a workhorse in a small package. 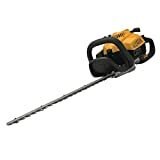 This particular model is a pole saw with an 8-inch blade, perfect for cutting limbs and branches without the use of a ladder. Depending on your height, the trimmer can reach up to 12 feet. The extension pole reaches 7 feet, and the chain is automatically lubricated with the auto oiler. The engine is a powerful 25cc, and the QuickStart technology makes startup a breeze. You can cut with ease, as the Maverick is lighter in weight than some of the other pole trimmer models. The Maverick is one of the most versatile models out there, as the unit can accept different attachments, such as a blower and edger. You’re getting a powerful tool at a great value. The hedge trimmer by ECHO is a great option for professional use. The unit has 20-inch, dual sided extra sharp blades. The blades are capable of cutting branches up to 5/8”, making the unit a great option for light professional use. You can comfortably hold the trimmer with the generously large handles. The ECHO has several built-in safety features, including a throttle lockout and a safety guard on the handle. The downside is the weight; at just over 20 pounds, the unit can be a little unwieldy for jobs that take a longer time to complete. If you live in cooler climates, the engine starts easily, even in colder weather. Tanaka is known for high-quality equipment, and this professional model is no exception. The powerful 24cc 2-stroke engine has a 1.3 horsepower and a low-emission system. The adjustable front handle allows for a flexible grip and angle adjustment for hard-to-reach shrubbery. The unit includes an ergonomically friendly 4-point anti-vibration system, and the unit is extremely light and easy to manipulate at only 13 pounds. The blade is 30 inches and single-sided, allowing you to only cut in one direction, but the blades are dual reciprocating. The Tanaka brand, while expensive, is known for long-term durability, and you get a generous 3-year consumer warranty. You won’t get any better than this or a professional-grade pole trimmer. You get a 92-inch reach, allowing you the ability to get to those hard-to-reach areas. As is typical to the brand, Tanaka offers a lengthy consumer warranty (7 years). The unit, while pricey, has a powerful 26.9cc 2-stroke engine, which meets emissions standards. In addition to the almost 7-foot pole reach, the double-sided blades add 21.6” of reach, and an articulating cutter head can be adjusted to cut at an angle. The cutter head has a range of movement of 90 degrees downward to 45 degrees upward. For power and reach you get out of this machine, you unit only weighs 13 pounds – a boon for working long hours on tall hedges. Yet another quality product from Tanaka, this model is a 30-inch, commercial-grade trimmer with dual-sided blades, making this a versatile. While not as powerful an engine as some of its other models, the 21cc 2-cycle engine still performs beautifully, and you can rest assured you’ll be getting a reliable tool. The trimmer features a forward-facing exhaust system, which avoids putting extra heat on your hedges, reducing the likelihood of burning. The handle provides exceptional comfort, as is has five positions of adjustment. In addition, Tanaka has designed this trimmer to reduce user fatigue; the trimmer has a spring mounted anti-vibration system. At just over 11 pounds, you’ll be able to work longer and more efficiently. The starting system is easy and efficient, and the blades have a cutting diameter capacity of ¾”. Robin Power Tools has developed an efficient, powerful, and lightweight hedge trimmer great for commercial or home use. The double reciprocating blade moves at a rate of 32 movements per second, and the 1.4” tooth pitch allows you to cut with ease. The HT221 is lightweight at 11.5 pounds and has a powerful 21.7cc engine. The unit has a relatively large fuel tank capacity of 21oz., and the fuel mixture ratio is an efficient 25:1. Gas hedge trimmers work hard for you and can give you better long-term results than electric or battery-powered models. Consider weight and engine power, as well as blade length and reach when choosing a hedge trimmer. Remember, some models offer additional flexibility in terms of grip and attachment capability.